Grateful Bites is operated by Ability 2 Work, a nonprofit founded in 2013 by a group parents who yearned for post-graduation opportunities for their differently abled children. Karen Monroy with members of the Grateful Bites team, from left, Zack, Nate, Eric, Mike and Harry. The bakery is staffed by young adults with developmental disabilities. The apprentices are hard at work at Grateful Bites, a sunlit café and bakery in Flemington. Mike, known as “the master of pies,” kneads dough. Nearby, Nate is frosting cakes. In a separate kitchen, Zack assembles sandwiches as Harry prepares a broccoli salad and coleslaw for the day’s lunch. 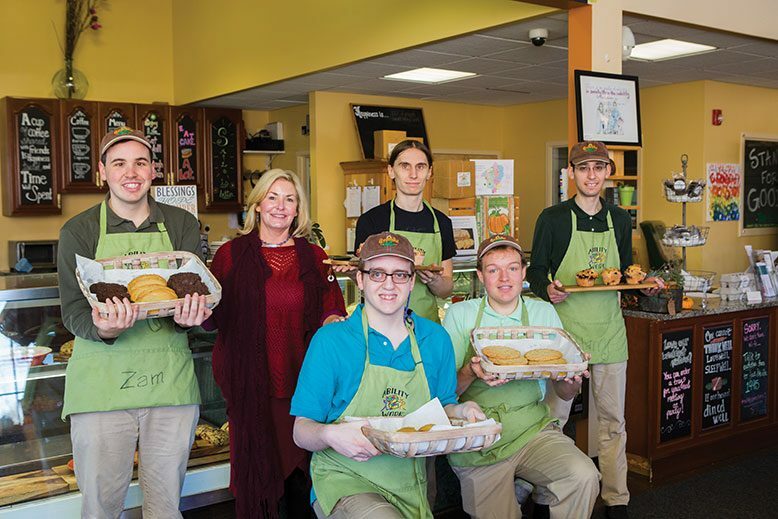 “I don’t mind the challenging days,” says Mike, one of 14 members of the bakery’s team of young adults with autism spectrum disorders, cerebral palsy or other developmental disabilities. Grateful Bites is operated by Ability 2 Work, a nonprofit founded in 2013 by Zack’s mother, Hunterdon County resident Karen Monroy, and a group of fellow parents who yearned for post-graduation opportunities for their differently abled children. Monroy began to plan for her son’s future five years before he graduated high school. (Zack is now 25.) She visited a number of programs offered through the state’s Division of Developmental Disabilities, but found none suitable. “I wanted a different choice,” she says. Few programs that employ Jerseyans with special needs are as inclusive and comprehensive as Grateful Bites. Each apprentice is paired with a support professional who oversees his or her work, whether it’s chopping vegetables, taking orders or serving customers lunch. Apprentices also are trained in life skills and cognitive therapy. The purpose is to ensure that they can “break down a task step by step, and finish the job successfully,” Monroy says. With the proper guidance, she says, differently abled individuals can succeed in a variety of settings. Ability 2 Work has placed apprentices in jobs at a local attorney’s office and at the outlets near the bakery in Liberty Village. Net proceeds from Grateful Bites go toward Ability 2 Work’s outreach and education programs, which support more than 400 differently abled students who are transitioning out of school and into jobs. Grateful Bites, at 42 Route 12, is open for breakfast and lunch, Wednesday through Sunday. There are no photos with those IDs or post 176965 does not have any attached images!